IAAPA is the largest tradeshow for the arcade & amusement industry and it is only a few weeks away. Continuing our coverage of that show is another preview of what to expect, this time from Chinese based Universal Space (UNIS). The company recently held an open house at their Dallas, TX warehouse. Let’s see what they plan on bringing. UNIS has been present at many IAAPA events and their company growth has been apparent as they expand booth space. Last year they had a large number of games to show, including a multiplayer motion theater and their interactive train ride. 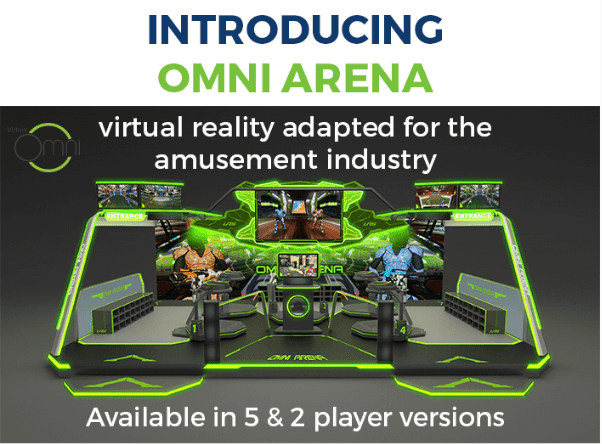 With Virtual Reality as the buzz word in entertainment at the moment, UNIS is among the first to offer a complete VR arcade solution called the OMNI Arena. Using the OMNI multi-directional treadmills so that the player can move in place. This is combined with HTC Vive VR headsets and personal kiosks to contain the experience. With a 2 or 5 player solution, it would be interesting to see if these many VR Arcades opening up out there might jump on this. I’m sure some FECs will. The flyer for the arena can be viewed here. To cover the more arcade style games that will be there, we will finally get our hands on Ultra Race. UR appears to be the sole video-only title they will debut but there can always be additions. Lane Master is a videmption game that is setup like a cross between skeeball and a video game. Roll the ball down the lane and knock down the virtual bowling pins on the screen. Then Outback Hunter makes a move onto the video hunting space but it is presented more like a shooting gallery style game (which are often animatronic) than a standalone arcade machine. Additional titles will be brought to the show but we will have to wait and see what they are. IAAPA 2016 happens the week of November 13th with the trade show opening on the 15th.